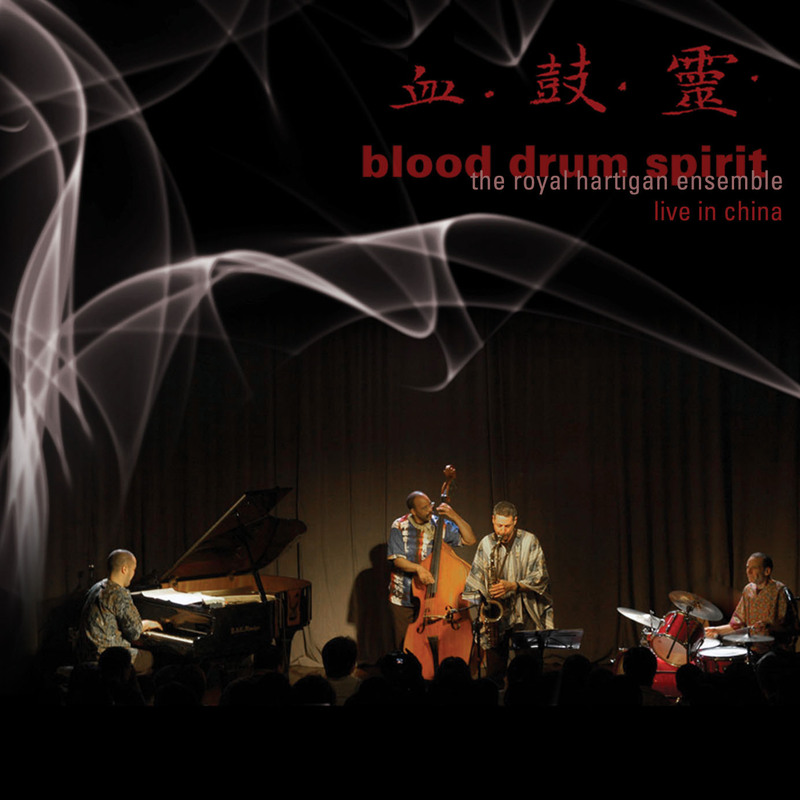 Blood Drum Spirit: the Royal Hartigan Ensemble Live in China is a new double compact disc from this unique quartet’s recent tour of China. Its tracks include original and standard pieces in the African American tradition, informed by music cultures of Asia, West Africa, and the Caribbean. Anlo Kete and Asante Adowa are based on traditional songs and dance drumming of the Ewe and Asante peoples of West Africa, while Gati Shadows Within is based on the drum rhythms of India. Flowing Stream, a love song from Yunnan province, is connected to Charles Mingus’ blues requiem for saxophonist Lester Young, Goodbye Pork Pie Hat. Hartigan, a percussionist who travels, lives, and performs in Asia, Africa, and other parts of the globe, has brought cultural and musical insights into this album, offering an original style of jazz interaction and performance with three of today’s most creative and experimental musicians, contrabassist Wes Brown, pianist Art Hirahara, and saxophonist David Bindman. Multi-sectional compositions in asymmetric time cycles with 7, 11, and 15 pulses move through funk, reggae, and Afro-Latin grooves, and yet swing in a new feel: Crisis in (Now’s The) Time, Threads, and High Definition Truth are extended works that form a trilogy composed by Bindman and center on the themes of political consciousness and global human interdependence. Hartigan’s DreamfiresWaking is joined to an arrangement of the standard Invitation over 11-pulse idioms adapted from West Africa, Cuba, and bebop. Hirahara’s Peace, Unknown is dedicated to the victims of the Middle East’s unending conflicts while the Generations Suite honors the elders of society. Song For Your Return is an experimental dialogue among the four performers. Blood Drum Spirit’s music is rooted in tradition yet brings jazz and other world traditions to a new place in creative music.